Freshwater shrimp make a good addition to most aquariums due to their ability as scavengers. 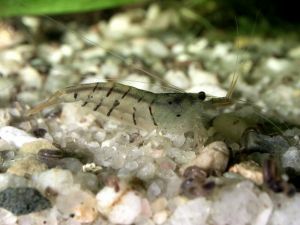 Many freshwater shrimp species are very good at finding even the smallest food particle hiding in the sand and can thereby help you keep the aquarium clean and the water quality high. All freshwater shrimp are however not good scavengers since some are capable hunters and it is therefore impossible that you learn more about the particular species in question before getting it. There are a wide variety of freshwater shrimp available in the aquarium trade and the different specie differs greatly in regards to size and behaviour as well as physical appearance. Some of the smaller species are to be considered adult at a length of 1 inch / 2.5 cm while the larger species easily grows larger than 4 inch / 10 cm. All freshwater shrimp moult their exoskeleton every few months as they grow larger and their old exoskeletons become too small. The shrimp are very vulnerable a period after moulting before their new exoskeletons hardened and they can during this period is eaten by fish that normally wouldn’t touch them. Freshwater shrimp should be offered hiding places of appropriate size during. These caves keep the freshwater shrimp save and make them feel more secure and at home in the aquarium. It is very easy to create suitable hiding places for most freshwater shrimp by putting flowerpots upside down on the bottom of the aquarium. Choose a flower pot with bottom holes of suitable size for your shrimps. Different freshwater shrimp are suitable to keep with different companions. Small species are best kept with small peaceful species such as Raboras, Livebearers, Danios and small tetras. Small freshwater shrimp should not be kept with aggressive species or specie large enough to eat them. Larger shrimp species can be kept with larger fish species and a little more aggressive species without the shrimp taking damage from it. Avoid keeping larger predatory freshwater shrimp with smaller fish since these easily become prey for the shrimp. There are freshwater shrimp available in the aquarium trade that thrives in most water conditions and water temperatures. Many adult freshwater shrimps accept a wide variety of water conditions while the larvae often are more sensitive and require more specific water conditions to survive. Most freshwater shrimp are scavengers and very easy to feed. They will accept most food types that are small enough for them to eat. Most species can be kept on a diet of flake food and the occasional portion of frozen food. Predatory freshwater shrimp can be feed pieces of fish meat as well as crab and shrimp meat. Feeding your shrimp should usually not be a problem since most freshwater shrimp are very easy to feed. Breeding freshwater shrimp is possible but raising the fry is often very hard because it’s hard to provide the larvae with enough small food. Most freshwater shrimp are more easily breed and raised in ponds where there are a normal presence of plankton sized food. Some freshwater shrimp will breed readily in their holding tanks while other requires salinity in the water to breed and for the larvae to survive. You will have to read about breeding your particular species to get a more detailed description on how to breed that species. Apple snail - An introduction to apple snails. Malaysian Rainbow Shrimp - Information on how to keep and breed this shrimp species. Red Cherry Shrimp - A guide to this Algae eating shrimp. 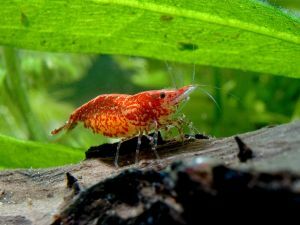 Red Nosed Shrimp - information on keeping this shrimp in aquarium. Snails: Friend or Foe in the Aquarium? - The biology of snails. Their advantages and disadvantages in an aquarium. How to keep them in check.